See how nice that spaetzle looks? I promise it tastes even better. But I know when you start reading the recipe to make it for yourself, you’re going to try to ruin it. You’ll look at the ingredient list and start thinking about how you can cut a few corners. “What ridiculously named olive does he want me to use?” you’ll ask. “Can I just use a regular lemon?” you’ll wonder. “I can just cook up some dried pasta, right?” you’ll reason. Castelvetrano olives are available in most grocery stores, in jars if not fresh. Preserved lemons can be found at any middle-eastern specialty shop – or you can easily make your own. And while making your own spaetzle might seem intimidating (many recipes tell you to press the dough through a colander) it really doesn’t have to be. Just use thumb and pointer finger to pinch off small bits of dough. A bit messy, but not challenging. The extra effort is worth it, I promise you. This dish is a sublime blend of tangy, salty, and creamy that nonetheless defies expectations of being too rich or heavy. The castelvetranos are meaty and buttery, spaetzle is nutty, and the preserved lemons are packed with concentrated zest and just the right tartness. A quick editorial note first. 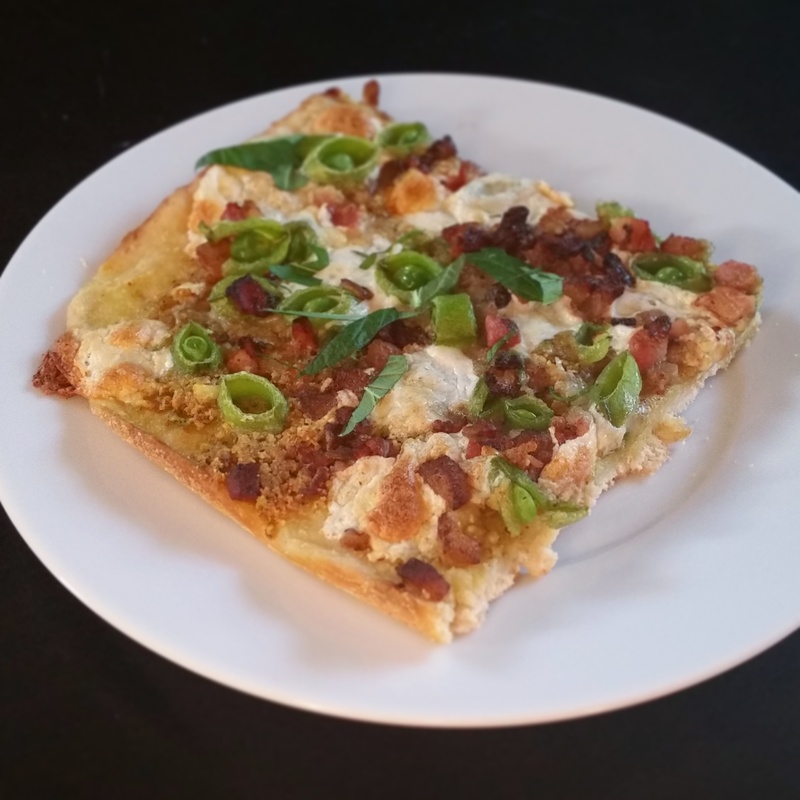 I know it’s been quite some time since I posted a new recipe here. I’ve written before about the challenges of keeping up regular posts between work and school, so I won’t get into it again. Since my last post, however, I’ve also gotten engaged (!!!) and adopted a cute but mischievous little pup (!). Needless to say, finding time to write – and even cook – has been difficult. In the past I’ve always said that I would get back to posting on a more regular schedule. I honestly don’t know if that will ever be the case. Cooking is a hobby and a passion for me, and sharing it with others – whether in person or on this blog – brings me a lot of joy. But when it feels like a chore or I feel guilty for not posting, the magic fades pretty quickly. So I hope you’ll check back now and again for new recipes – or better yet sign up for updates! – but no promises about getting back to new recipes every week. Pumpkin-mania is here folks. Lattes, beer, ice cream, pie – you name it. If it’s Autumn, it’s pumpkin. A lot of people make fun of the pumpkin craze, but I for one welcome our new pumpkin overlords. Pumpkin and its other squash-kin are delicious, vibrant, versatile, and cheap. They are great in a wide array of sweet and savory dishes and the perfect antidote to cold-weather gloom. However, even though pumpkin dominates Autumn like no other seasonal vegetable and pairs great with all things sweet and creamy, there is a surprising lack of pumpkin cocktails. If you’ve been reading this blog for much time, you probably know that I’m a big fan of culinary challenges. Unusual ingredients, strange kitchen set ups – you name it. Recently though, I completed a trial like no other. I spent two weeks as a vegetarian. Yes, it’s true. Your humble blogger and avowed carnivore went fourteen days without a single bite of meat. It was part of a deal that my girlfriend and I made to “eat healthier,” because meat is “bad for you.” In exchange she agreed to give up sweets for two weeks. I think I got the raw end of the deal. This pizza is your new best friend. It will give a ride to the airport at a moment’s notice. It knows when something is wrong before you even say a word. It always has the next round. I kid, of course – but this is a darn good pie. The pistachio sauce is a nutty, subtle alternative to the more traditional aggressive red and rich white pizza bases. The salty, smokey pancetta and crisp sugar snap peas are like a see-saw, rocking your tongue gently back and forth between two flavors. Everything is bound together by mozzarella, and cut with just a hint of mint to keep things cool. With both the legislative session and school winding down, I’m making it a goal this summer to really explore one or two international cuisines. I realized recently that not really having the opportunity to cook for several months has left me in something of a culinary rut. I think a deep dive into the subtleties of a specific palette is just what the chef-doctor ordered. And since a visit to Spain many years ago was what really piqued my interest in cooking, so it only seemed like a fitting place to return. 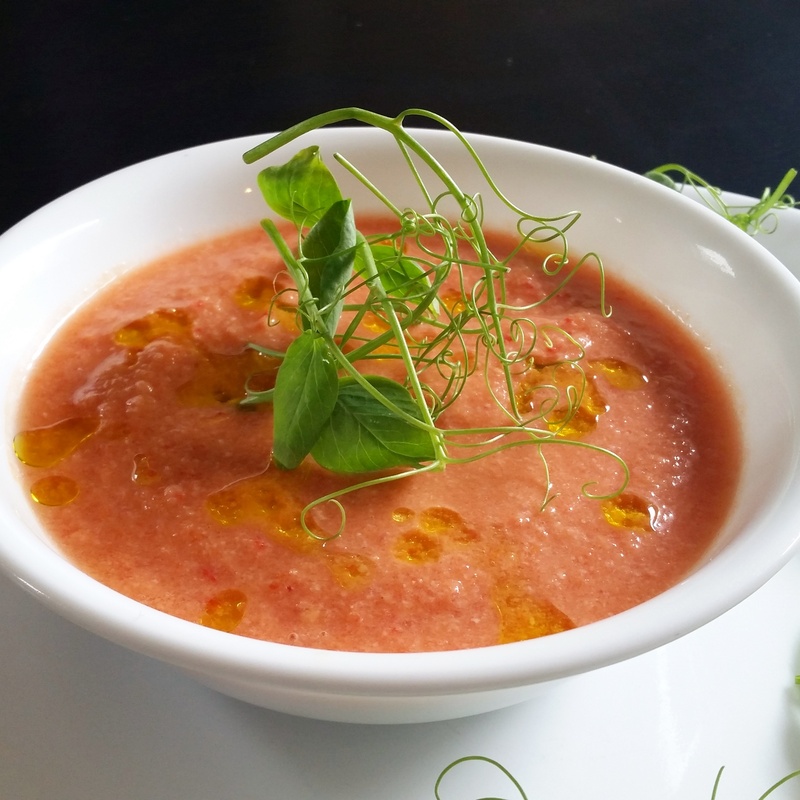 There are hundreds of ways to spice up a gazpacho recipe – and believe me, I’ll be back here with some of my own takes down the road – but for a quick, refreshing dish on a hot day, you can’t beat the original. Don’t say I’m not a man of my word. Technically the addition of bread to this dish would make it salmorejo, the less famous cousin of gazpacho, but it’s largely the same concept. 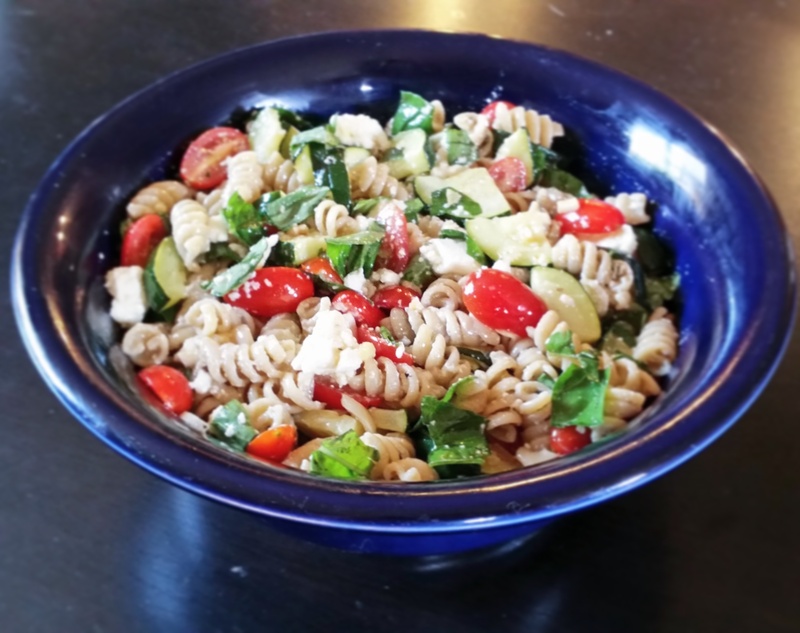 This recipe is a bit heartier – enough to be a light meal by itself – but still delightful for a warm summer day. The fried capers offer little bursts of salt and vinegar that help break up the flavor of the soup. The pea shoots, meanwhile, are a beautiful visual addition that also provide some diversity in texture. Traditional? Not as much. Delicious? Sí. Place the cubed bread in a small bowl with the vinegar. Let it stand until all of the liquid has been absorbed so that the bread is slightly soggy. Roughly chop the red pepper, tomatoes, cucumber, onion, and garlic. Don’t worry about getting them too small or the same size. Add the chopped vegetables to food processor along with the bread, pimentón, cumin and quarter cup of olive oil. Blend to your desired consistency (there are all manner of opinions on how much you should blend your gazpacho. I’m a fan of almost completely smooth, but it’s up to you). Chill the soup for at least 30 minutes in the refrigerator before serving. Feel free to let it sit overnight, as the flavors only develop over time. To serve, fry your capers in a small sauce pan with a dash of oil until lightly crisped and beginning to lose their shape, about 2-3 minutes. Drizzle a bit of olive oil over the gazpacho and top with a handful of capers and the pea shoots. No, you didn’t miss it. We made the difficult decision last time to stop live blogging our beer brackets. Not only does it slow down the process as we furiously write up mid-tournament reviews, but, frankly, the quality of blogging declines as the bracket goes on (ahem). 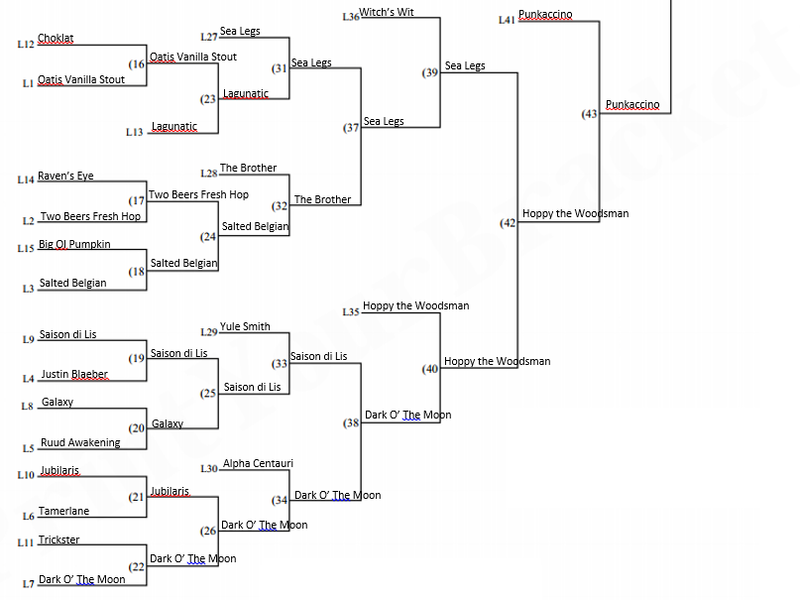 So instead, here is our post-game analysis of Beer Bracket IV: A New Hop. There were a couple highlights this time around. For starters, its the first time that a #1 seed has gone all the way. The Cuvée des Jacobins Rouge, a delightfully tart and complex Flemish Sour Ale from Belgium, didn’t lose a single match up on its way to the crown. 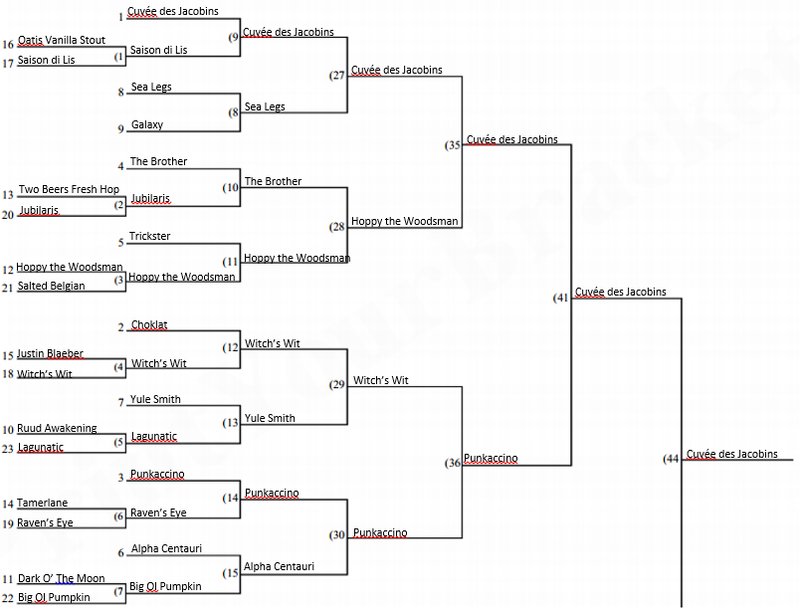 All our previous winners rose up from the losers bracket to take the top spot. Southern Tier’s Choklat won the annual “top tier seed crashes and burns” award. Chocolate notes have many fans in the beer community, but our judges did not look favorably on what tasted like carbonated chocolate water. This was also (sadly) the farthest a Washington beer has got in the competition. Elysian’s Punkaccino – a flavorful and well-balanced coffee and pumpkin ale – put up a good fight in the championship against the Cuvée, but was ultimately unsuccessful. Someday, Washington beers! Stay tuned, our fifth bracket is imminent and it is bound to be an exciting one! Once again I have to apologize for how tardy I’ve been in posting new recipes. I actually made this dish back on Valentine’s Day, but work and school have been all-consuming over the past several months. Add in the fact that Maggie and I just bought our first home (!!!) and you can imagine it’s been a very busy time for me. Now that things have settled down though I hope to get back to a more regular posting schedule. If you were expecting a verbose return, I’m going to disappoint you once more; there isn’t that much to say about this dish. 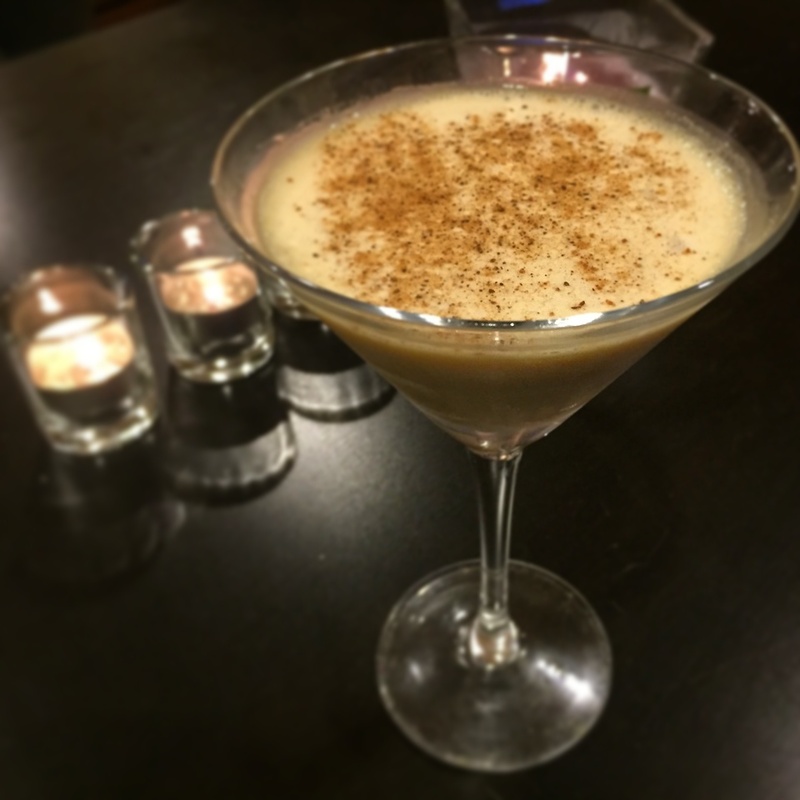 It’s cream, vanilla, nutmeg, chocolate – and bourbon. If you aren’t sold after hearing that lineup, you might be a lost cause. I just don’t think there is anything I can do. 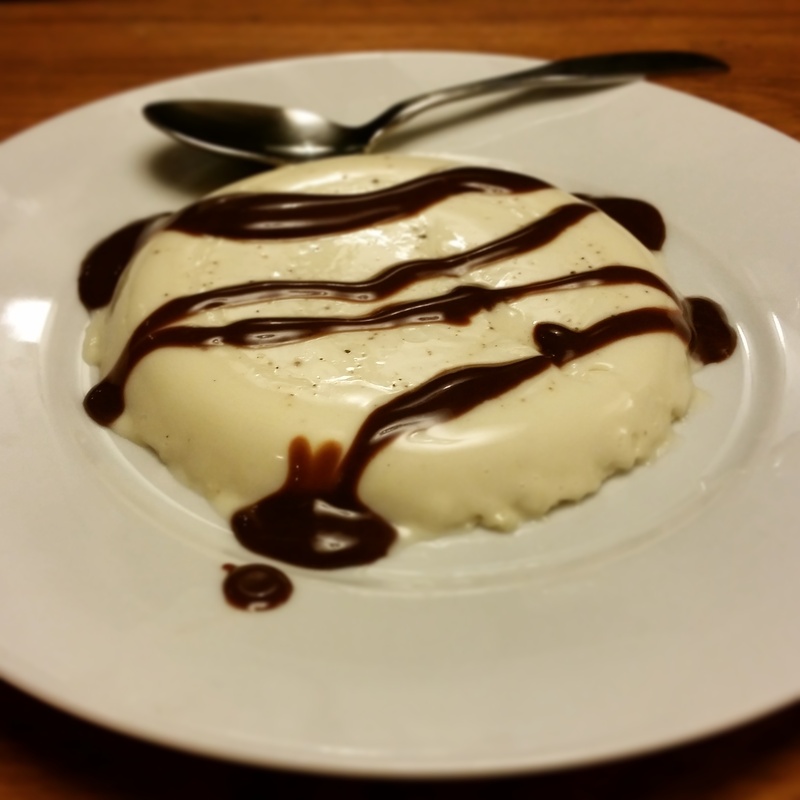 The real uniqueness of panna cotta comes from the silky yet firm texture and, of course, the presentation. I used a broad, shallow dish for the cast, but you can really use any shape you want as long as you can get the panna cotta out after a warm water bath. Feel free to experiment! Pour the bourbon into a bowl and sprinkle the gelatin over it. Let stand for 4-5 minutes until the gelatin has softened and dissolved. In a saucepan, heat the cream on medium until it begins to simmer. Add the sugar, vanilla extract, and nutmeg and continue to simmer, stirring occasionally, for about 5 minutes or until the sugar has dissolved. Pour the cream mixture into the bowl and gentle mix into the bourbon and gelatin until fully incorporated. Divide the mixture into serving vessels and refrigerate for at least four hours to give the panna cotta time to set up. In a saucepan, heat the 1/2 cup of heavy cream to a simmer. Add the brown sugar, salt and butter and continue simmering until dissolved. Add in half the chocolate and continue stirring until melted and mixed in. Repeat with the second half of the chocolate and remove the pan from the heat. To serve, fill a pot or casserole dish with hot water and set the panna cotta vessels inside so that the tops are just above the water line. After about 1 minute, remove the vessels from the water and run a knife along the outside edge. Gently flip the vessel onto a plate, giving it a light pat if the panna cotta doesn’t come free immediately. Drizzle with hot fudge sauce and serve. Bloggers note – It has been longer that I like since my last post. The legislature is once again in session, which means my day job is substantially busier than normal. There may be a bit more time between posts, but I promise to keep the recipes coming! Now, to the dish at hand. The BLT is a classic, but that doesn’t mean it can’t be made better by importing some flavors from Korean cuisine. In this recipe, it is brightened by tangy, spicy kimchi that perfectly complements the salty bacon and ripe tomato. The addition of a creamy, runny egg not only builds on the complexity of flavor, but also makes the meal a bit more substantive. Easy to assemble while remaining both delicious and unique, this sandwich is great for a fun lunch or weeknight dinner! In a bowl, combine the garlic, lemon juice and mayonnaise until evenly incorporated. Let the mixture sit while you cook the remaining ingredients. Heat a skillet to medium-high and cook the bacon in a skillet until crispy, about 3-4 minutes on each side. Remove the bacon to a paper towel and set aside. Reduce the heat to medium and crack the egg into the skillet. Let it cook for about 3 minutes, until lightly browned and crispy, then flip using a spatula. Sear the egg for 1 minute on the other side before removing it from the skillet, so that they yolk is still slightly runny. 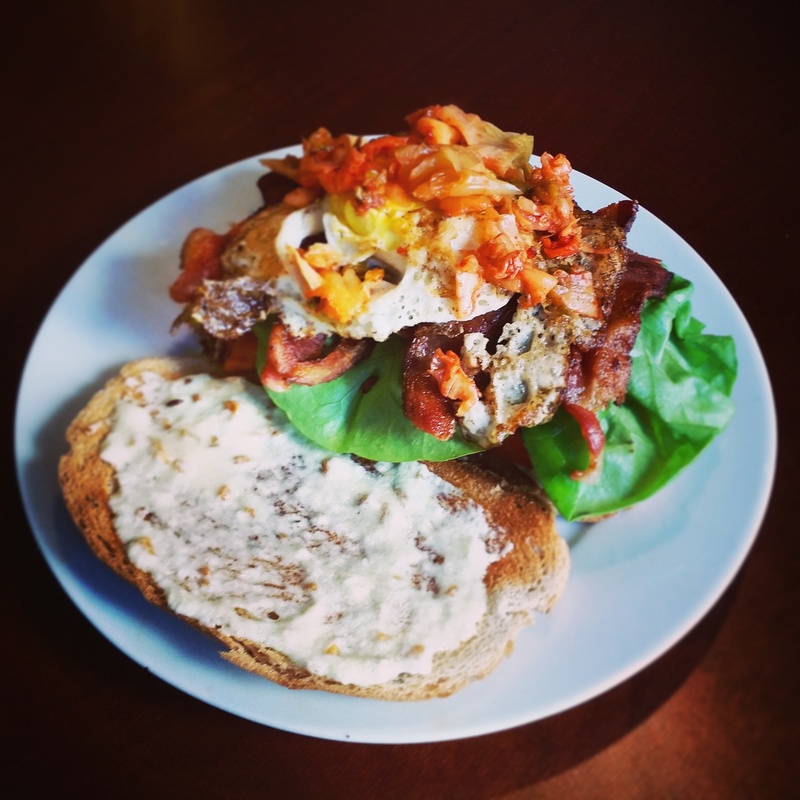 To assemble the sandwich, spread the garlic aioli on each piece of bread, then layer the egg, bacon, tomato, lettuce and kimchi on top. 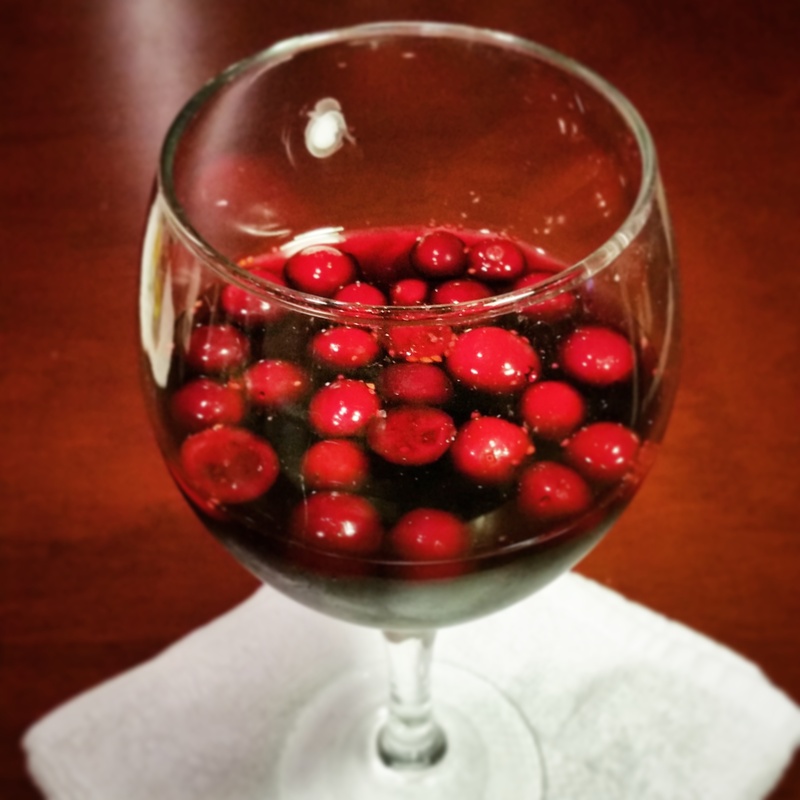 The best place for cranberries at your Thanksgiving table isn’t in a sauce or baked into an overly sweetened dessert – it’s in your wine glass. Cranberries are the feature ingredient in this festive sangria, bestowing some of their signature tartness to compliment to the warm, sugary notes of brandy. In turn, they absorb some of the sweetness from the other ingredients, making them palatable – dare I say enjoyable even – to eat themselves once you’ve finished your drink. Set against a backdrop of cinnamon, nutmeg, clove and orange, this sangria blends classic Spanish influences with holiday flavors for an unique, belly-warming beverage. And while cranberries are a Thanksgiving mainstay, this recipe would be equally suited for any wintertime holiday. Cheers!